A couple days ago, I was walking through Thompkins Square Park near Saint Marx and Avenue A in New York City. The park is full of playgrounds, basketball courts, and elegant places to relax while enjoying the city’s vibrant atmosphere. Sounds of children playing and street musicians fill the air on any reasonably sunny afternoon. And in the middle of all this culture and debauchery, sits a single ping-pong table. It isn’t your ordinary fold-up ping-pong table with a mesh net and four well-balanced legs. Instead, it sits like a stone— its marble coating gleams from the sun’s rays, and its black net, composed of some sort of hard material that I can’t exactly put my finger on, helps to add to its unique nature. 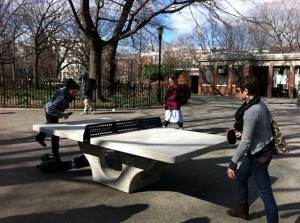 Truly, it is unlike any other ping pong table that I’ve ever before. And on this day, about fifteen different people stood around the table, some with racquets in their hands and others simply looking on at the action, watching two players compete for table supremacy. I quickly glanced over at the basketball courts and saw two separate 3 on 3 basketball games taking place. For a moment, it seemed as if ping-pong was more popular than basketball. 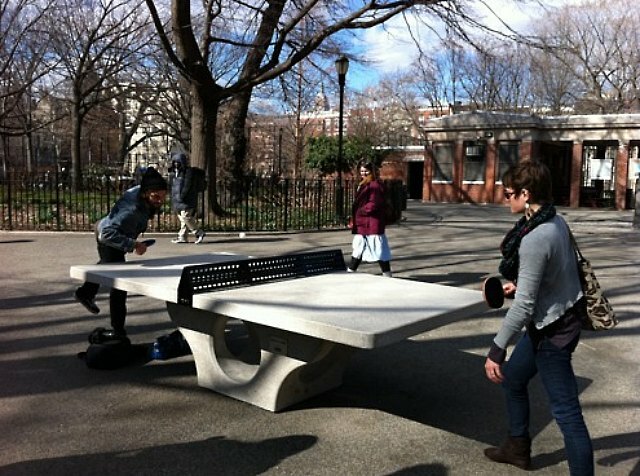 And it got me wondering; if there were more ping-pong tables in American parks, wouldn’t the sport’s popularity in the States rise ten fold? After all, basketball became popular in America as a street game, what’s to say ping-pong can’t do the same. 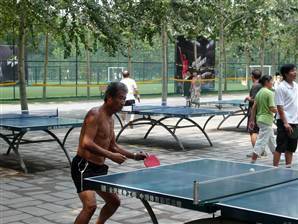 If you look at parks in China and Germany, ping-pong tables are everywhere. From Berlin to Beijing, people bring their racquets to the park on a daily basis just looking for action. There’s no reason why the same thing can’t occur in America!